Just across the river, in Covington, KY, sits a 19th century village as unique as its heritage. MainStrasse Village is a commotion of pubs, quaint boutiques and eateries. a wonderful way to enjoy the weather, some amazing architecture and a ghostly tale is to take a twilight stroll through Covington's Licking Riverside Historic District, where gracious, Southern-style mansions are dimly lit by the soft glow of street lamps. 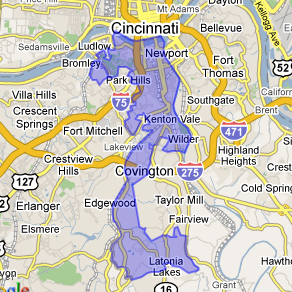 Northern Kentucky's largest city, Covington is, at its heart, a river city. Covington Landing is home to several popular restaurants and clubs... Tristate residents on both sides of the river visit Covington for MainStrasse Village and Downtown Covington.